My wish in doing this play was to examine how we all play roles in our daily life. I wanted to look at how we edit out the messy, ugly, difficult parts of ourselves, our friends and our family: how we create fantasies to justify the things we're afraid of or the things that don't fit our proclaimed identity. Women dream they can be everything to everyone and never break a sweat. Men dream they can live in this terrible tumultuous world and never appear weak. If we fail to do this, we're met with shame. Dolls are people who run from shame faster than they run from death. I don't judge dolls. I am one. Anyone can be one. Nora (Kim Blank) returns from a Christmas shopping spree. Nora (Kim Blank) and the nanny, Anna (N' Jameh Camara), share forbidden chocolates. Torvald (Toby Onwumere) kisses Nora (Kim Blank) after giving her a string of pearls. 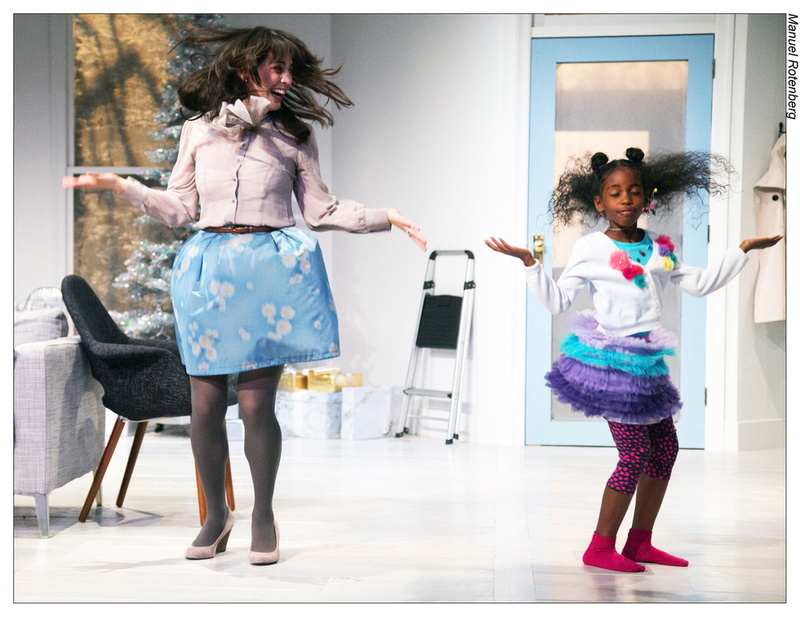 Nora (Kim Blank) teaches her daughter Emmy (Lauren Rowe) how to do a dance to "Santa Baby." Nora (Kim Blank) begs Krogstad (MacGregor Arney) not to deliver the letter about her forgery to Torvald. Rank (Ronald Washington) tries to kiss Nora (Kim Blank) after confessing that he is dying. Nora (Kim Blank) dances to distract Torvald (Toby Onwumere) from checking the mail. Nora (Kim Blank) and Torvald (Toby Onwumere) return from the costume party to find Kristine (Jasmine St. Clair) at their house. A very drunk Rank (Ronald Washington) comes to say a final goodbye to Torvald (Toby Onwumere) and Nora after the costume party. Nora (Kim Blank) attempts to kill herself. Nora (Kim Blank) goes upstairs to change after an ugly confrontation with Torvald (Toby Onwumere). Torvald (Toby Onwumere) stands by the door as the fact that Nora has left sinks in. Nora (Kim Blank) walks out into the snow after leaving her husband and child. Performed by : Kim Blank, Toby Onwumere, Jasmine St. Clair, Ronald Washington, N'Jameh Camara, Macgregor J. Arney, Lauren Rowe.